The following obituary appeared in The Washington Post on 22 May 2016. 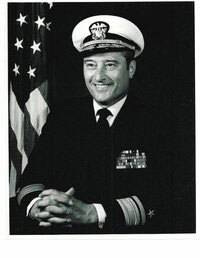 ALBERT M. SACKETT, Rear Admiral, U.S. Navy, died peacefully at home in Knollwood, in Washington, DC, on Friday, May 20, 2016. He was born in Victor, Iowa on June 24, 1920. His parents were Timothy Frank Sackett and Clara DeMeulenaere Sackett. His father died when Albert was only 2½ months old, and his mother was left to raise him and his three siblings, Genevieve, William and Jean, all deceased. He credits the molding of his character, work ethics and life to his mother, the Sisters of St. Francis, who taught him throughout school, and later in life to wife, Patricia (Patt). She was his best friend and mother of their children. She raised them many times by herself while he was off to war and the numerous ship deployments to the Mediterranean and the Far East. She and his family were a beacon for the sailor to return to. He considered winning her hand in marriage on August 2, 1947 as the highlight of his life. Admiral Sackett had a very successful 40 year career in the Navy. Following recruit training in 1937, at the Great Lakes, Illinois, training center, he was assigned to his first ship, the USS Northampton (CA-26), a heavy cruiser attached to the Pacific Fleet. The pre-World War II years were spent in training and preparing to serve our nation in war. In 1939, the Navy established a task force, composed of two aircraft carriers, two cruiser divisions (Northampton included) and a flotilla of destroyers and ordered them to Pear Harbor, Hawaii. This task force operated throughout the Pacific, many times shadowing Japanese shipping and preparing for the ultimate conflict. He re-enlisted in the summer of 1941 and returned to the East Coast for assignment to another ship, the USS Jamestown, which led the first PT Boat squadron involved with the U.S. Marines in the capture and defense of Guadalcanal. Following the capture, the Jamestown operated in support of the landings and occupation of other islands in the Solomon Islands. By this time, he had advanced to Chief Petty Officer and was recommended for appointment as a commissioned officer. He was then assigned to a rocket ship, the USS LCI (R) 74, at Leyte Gulf, Philippines. Through most of the remainder of the war his ship participated in many amphibious assault landings throughout the Philippines, Borneo and East Indies. During the latter part of the war he was ordered to command his first ship, the USS LCI (R) 34. The ship''s role was preparing for the landings on the homeland of Japan. The dropping of the atomic bombs forced the Japanese to surrender, unconditionally. Following the war, he was ordered to take command of the USS LST 990 and operated for another year consolidating equipment through the captured islands, finally returning to the States in mid-1946. Subsequent sea assignments were in command of four more ships, the USS LSM 109, destroyer USS Preston DD 795 during the Korean War, the guided missile destroyer USS John King DD (G) 3, and the guided missile cruiser USS Gridley CA 21 during the Vietnam War. He also had three shore commands—the Naval Destroyer School in Newport, Rhode Island, where all officers ordered to serve in the destroyers were trained; Chief of Naval Technical Training Command in Memphis, Tennessee, which included 57 commands under him conducting all of the Navy''s enlisted training; and his last assignment as the Commandant of the Ninth Naval District in Great Lakes, Illinois. The Admiral also had duty at Naval Headquarters in Washington DC, once as the Special Assistant to the Secretary of the Navy and another tour as Head of Officer Distribution at the Bureau of Naval Personnel. He, along with a sizable staff, was responsible for the management and assignment of 70,000 naval officers. After his retirement from the Navy, Admiral Sackett held several leadership roles in Memphis, Tennessee, most memorably as the Vice President of Community Relations at the Memphis Commercial Appeal. He proudly served on the boards of 19 organizations and was an avid golfer, with three holes-in-one to his name. He and Patt traveled extensively and enjoyed reading, playing cards and spending time with their family and friends. He is survived by his wife, Patt, who resides in Washington, DC; and his six children, Priscilla (Mike Nicholls), Timothy, Albert, Kirk (Suzanne), David (Dulce) and Julie Butler (Syd). He had 10 grandchildren, Steven, Amy, Christina, Christopher, Cadee, Maggie, Mallory, Ashley, Shane and Nicole; and seven great-grandchildren, Andrew, Caleb, David, Aaron, Callie, Caydence and Gabriel. He also leaves his many friends, especially his golf friends and his many relatives, mostly in Victor, Iowa. He treasured their friendship. A private family memorial service, with burial in Victor, Iowa is planned. In lieu of flowers, the family requests that donations be made in Albert's name to Children's National Medical Center, 801 Roeder Rd., Suite 300, Silver Spring, MD 20910; or the charity of your choice. A private family memorial service, with burial in Victor, Iowa is planned. See also Joe B. Havens. Chief: the evolution, development and role of the chief petty officer in the United States Naval Service. News story The Commercial Appeal, May 2016. Obituary, Washington Post, 22 May 2016. Sackett, Albert M, son, 9, b. IA, father b. IA, mother b. Belgium.